Create a professional-approved hotel front desk resume by downloading the sample below and using our expert writing tips. Want to save time? Just use our fast and easy resume builder! Experienced hospitality worker (4+ years) with a BA in Hospitality Management. Proven ability to run a hotel front desk, keep customers satisfied, and resolve conflicts. Responsible, knowledgeable, and technically savvy, the perfect candidate your Hotel Front Desk Manager job. ‘Hospitality’ covers a broad range of job titles, all of which are a form of customer service related to hosting, catering to, and entertaining guests. The resume above covers a person who worked as a front desk clerk and hotel bellhop. 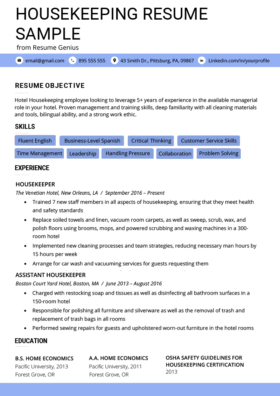 If you did not work in those specific jobs, don’t worry — all hospitality jobs require the same customer service skill sets, so you will still be able to learn from this resume example. A hotel bellhop provides excellent customer service. Ultimately, the ability to deal with customers in a proactive and professional manner is a skill every hospitality business seeks in its employees.Therefore, a hospitality resume that emphasizes these key abilities can definitely help you find a long lasting career. This is a fantastic sample resume — one that would capture the attention of any hiring manager. We’ll break it down, and help you understand how to write your own in a similar fashion. Training: There are many hospitality jobs that don’t require a degree or special certifications. However, there are some that do — and even if it’s not required, getting them can help you earn a higher hourly wage and make you a more competitive job candidate. Please see the hospitality certifications on this page from the American Hotel and Lodging Educational Institute (AHLEI). Displaying your relevant certifications at the top of your resume is the fastest way to keep a hiring manager interested. Personality: Hospitality is all about the old adage, “Service with a Smile.” Hospitality establishments are looking for outgoing, personable, and friendly people who can keep guests comfortable, entertained, and relaxed. Are you skilled at conflict resolution, an inevitable aspect of dealing with guests and customers? This is yet another skill that you can get training in and display prominently on your resume. Technical: Whether you’re operating Point of Sale (POS) Terminals, captaining a tour boat, driving a horse and buggy carriage, handling credit cards and cash at the front desk, or working a security system, hospitality jobs require some specialized technical ability of some sort. Displaying your technical experience on your resume is a fast way to demonstrate to the hiring manager that you will require less training and therefore will be a stronger candidate. 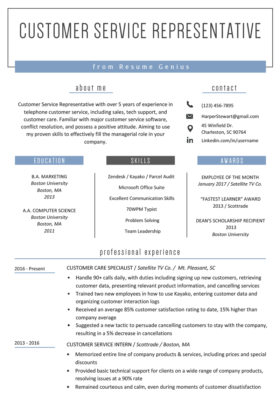 Bearing these three general hospitality & customer service skill sets in mind, let’s dive into the specifics of this resume sample to see how this candidate wrote a fantastic resume. The hospitality industry is bigger than simply hotels and lodging. Experienced hospitality worker (4+ years)1 with a BA in Hospitality Management2. Proven ability to run a hotel front desk, keep customers satisfied, and resolve conflicts. Responsible, knowledgeable, and technically savvy3, the perfect candidate your Hotel Front Desk Manager4 job. 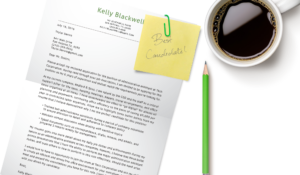 Follow those guidelines to make a strong introduction to your resume. All of the claims you made in the Career Objective should be proven with your bullet points. Aim to describe your work experience with numbers and achievements, rather than bland duties. Training other people indicates that you have management skills, in depth knowledge, and that other people trusted you with important tasks. Here’s how this candidate did it — with attention to the bolding. By describing the size of the hotel numerically, a hiring manager gets a much better idea about the scope of the candidate’s responsibility. If your performance is being tracked in any way, find out the numbers and include them on your resume (only if they are good, of course.) Customer satisfaction surveys are extremely common in the hospitality industry, use them to your advantage. Maintaining a 95% rating is an excellent boon for any hospitality resume. If you have ever trained any employees, mention it, and specify what you trained them to do. We highlighted “trained” in red because it’s a powerful resume building keyword to include on a resume, — it means you have management skills, in depth knowledge, and that other people trusted you with important tasks. Why Else Are These Good Examples? The applicant already had solid hospitality experience due to his previous jobs as a bellhop and a front desk clerk. These are great examples because he quantified (added numbers to) the bullet points. Think about your own professional experience in terms of where you can showcase your talents and abilities, and grab the attention of the hiring manager. Here’s an example of a poorly written bullet point — can you see why? The bottom description gives the hiring manager a much clearer picture of the scope of your abilities, and also emphasizes your attention to detail. Is Your Professional Experience Formatted Correctly? Be sure to read our resume formatting page to understand why your resume should be written in either a functional, reverse-chronological, or combination style. The way you present your experience can actually have a huge effect on your chances of getting an interview. Stressing teamwork and organizational skills are key for creating an attractive hospitality resume. Including skills like communication skills, organization skills, software/technical knowledge and language skills are all abilities that can be used in a hospitality position. Stressing teamwork and organizational skills are key for creating an attractive hospitality resume, as most positions require working closely in teams and with other associates to complete tasks and manage customers. Now You know you have the skills, but do you know how to present them persuasively? Learn the advance level of presenting skills on your resume here. There’s more where that came from. Come visit our longest list of action verbs in the universe! Ultimately, a resume with a hospitality focus will look much like the sample above, focusing on customer interactions and coworker communication skills.